It’s been more than a year since Walt Disney World first announced MyMagic+, revealing details of new ways to reserve times for rides, shows, and other attractions. Now the new technologies aimed at improving daily theme park enjoyment are finally approaching their full rollout leading up to an official launch this summer. MagicBands have been selectively available and in testing for guests staying at Walt Disney World resort hotels for several months. Now, annual passholders are being included with their first fully customizable MagicBands beginning to ship within the next couple weeks. 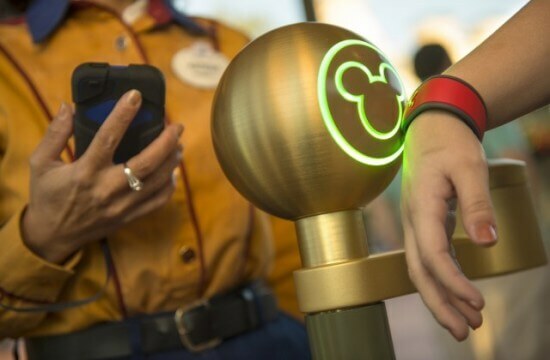 Tied together with the new FastPass+ system, MagicBands are equipped with RFID technology that allows Walt Disney World guests to simply tap Mickey Mouse-emblazened readers to gain entry into theme parks, access hotel rooms, and check in for ride, show, parade, fireworks, and other attraction reservations. The specifics of how, when, and how many reservations can be made are still being worked out. Currently resort guests can book FastPass+ reservations months in advance, creating schedules of up to three selections for each day of their visit. Annual passholders, on the other hand, may only make up to 7 days’ worth of reservations within a 60-day window 30-day window. These and other details may change as the full rollout approaches in the coming months. Annual passholders who currently want to order a MagicBand simply need to log in to the My Disney Experience web site. To customize and order a MagicBand – and thus enable FastPass+ – look for a message stating “Personalize Your MagicBands” on the site’s welcome screen. 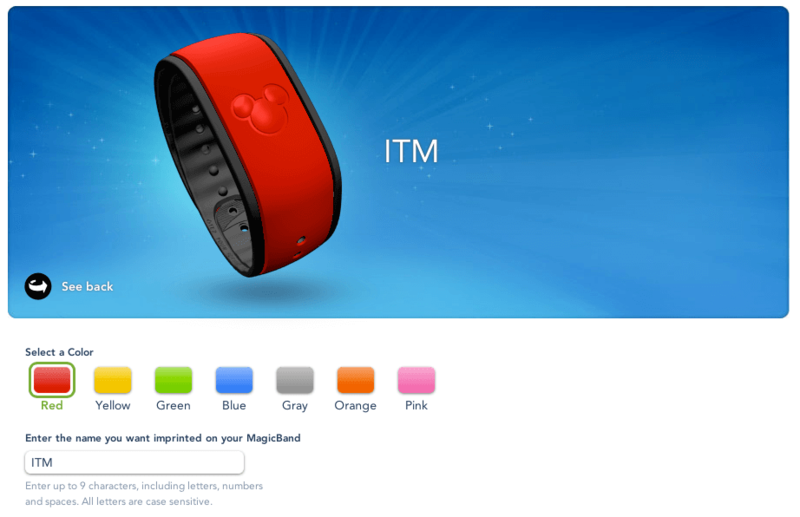 From there, customization options include choosing a color and a name to print on the inside of the MagicBand, up to 9 characters in length. My first attempt at creating a Haunted Mansion-inspired customization was thwarted by the lack of purple available as a color. I also briefly considered an Inside the Magic-branded option. But ultimately I decided on a Halloween-inspired motif. Orange and black look lovely together. After deciding on a design, a click of the “Ship Now” button locks in the choices. The site states MagicBands will begin shipping for annual passholders in mid-March. Like the entire MyMagic+ system, the My Disney Experience site is still working out a few bugs, throwing an occasional error. But for the most part the process of ordering a MagicBand is simple and smooth, in the process of reaching the entire Walt Disney World audience. The use of a MagicBand is not specifically required once enrolled in MyMagic+ through ordering one. Walt Disney World tickets and annual passes now have RFID chips built in as well to also work with the new system. The official rollout of MyMagic+ and FastPass+ is expected to take place during Walt Disney World’s upcoming press event at the end of April / beginning of May. Beyond that, the future of MyMagic+ will include more personalization of attractions and character interactions, all intended to improve the overall experience of being in Disney’s parks. Will Disneyland be getting this in the future? There are no announced plans to bring MyMagic+, FastPass+, or MagicBands to Disneyland at this time. However, Disney has said that “a version” of this will eventually make its way to parks worldwide. But that doesn’t mean these specifics will apply anywhere outside of Walt Disney World. Hooray! The West Coast is safe from the spread of the fungus that is Magic Bands. Will AP still need there passes to get discounts on merchandise? I totally agree with you John. It also makes the park hopper not necessary because you can only get the 3 fast passes in one park per day. Because back before fast pass was incepted for crowd control, there wasn’t a need for them. Now, since Disney has barely added any new and noteworthy attractions, waiting for 2 hours to ride a ride is ridiculous. The continue adding new shops, they really should have invested the ‘billion’ spent on the new fastpass+ on new rides and attractions – and not removing attractions – further compounding the issue. And let’s not mention the new fantasyland expansion. A bunch of new stores and two new attractions hardly equates to an investment toward improving crowd control and the overall guest experience. Point blank, more rides are needed in ALL parks. I’m not sure how your equation works out that waiting for 2 hours for an attraction was not ridiculous 15 years ago but it is ridiculous now that there are a few more rides. Or not enough new rides. Or something. I’m not exactly sure what your argument is (or your math, since New Fantasyland, as a whole, is producing 5 new attractions). I have the feeling that FP+ still exists for the purposes of crowd control… in this case, redistributing people across all the lines in the park. That means that we’re probably all going to have to get used to waiting in lines again. I will personally buy a drink to anyone who starts a PETITION against the new system. Seriously someone start a petition and a facebook page. Instead of offering to buy someone a drink you could start the petition. The Chase Bank Cardholder Character Photo Ops which directly exclude any non US citizen (Canadians unite!). There is even a scheduled day at Disneyland to protest the lack of east coast Star Wars Weekends. And don’t even get me started about losing Dance-Off with the Star Wars Star because it was TOO popular or Camp Minnie-Mickey to make room for (Ugh) Avatorland. Disney is such a huge corporation, we are ants. They won’t even care if a large number boycotted altogether; it wouldn’t even show on their fiscal sheets. I’m just happy that finally paper FP users can get no more daily FP than Magic Band users. Until then, it was a rather sore spot for me. Meanwhile, I’ll be in Disneyland using 15 FP a day. Even after you receive your magic band, make sure to bring your physical AP ticket as well as a photo ID with you if you plan on using any discounts. Unfortunately MATRA register system used in WDW shops can’t automatically detect potential discounts and the CM will still have to process it manually. The same goes for DVC members. Hopefully this will be fixed in the future! If you sign up for My Disney Experience on your cell phone, it will remember when your Fast Passes are for you. Admittedly I do miss the days before the 3 FP limits, as I used to go through 10-12 paper FP on a bad day. Disney is also being quite silly in reducing FP, tying more people up in lines when they could be in the store shopping. Finally, pre-booking FP even just 30 days before my trip (Premier Annual Passholder) takes all the spontaneity out of the trip for me. Dining reservations 180 days out (or you won’t get your table) combined with FP 30 days out means I have dictated which park I will visit each day long before my trip (and often before Disney has bothered to post park hours or entertainment schedules). Thank you, Rebecca! That is good news. I can’t wait until we can book multiple E ticket rides and multiple parks. We are big park hoppers (love to eat in EPCOT everyday). Sorry if this is repeated question. Is the annual passholder hard cards going away? Example if I’m over my friends house and we deceide to g oto Disney do I need to go home to retrive my magic band? I find it easier to have my card in my wallet. Excellent question, I’d love to see the answer on this one. I would like to know this too? I might order a band but I’d like to interchange the two – card and band – if possible. Otherwise, it might not be worth the risk ordering, if it invalidates my card. Te band and the card can both be active on yor account as a pass holder. This allows you to use either option since the hard card is RFID enabled as well! 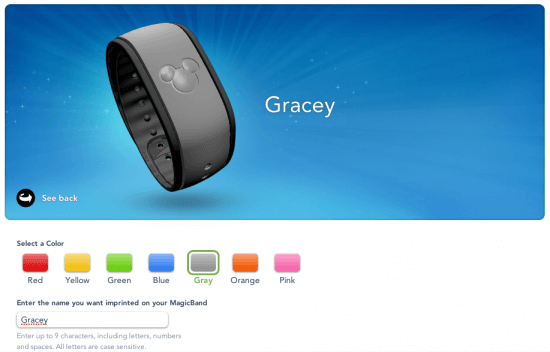 Will Disneyland Resort be geting the magic bands? Michael – check out the first post. Maybe somethere my answer your question. Theres a couple of replies. But in short it looks to be no. Christy – Its my understanding yes. If you place a resevation you can just keep “attaching” thay to your band. Now if your band gets lost or damage I’m not sure how it works. You will get a new magic band each time you stay at a Disney resort. They said you can have many magic bands all linked to the same account. But yes they will work all year for you. I was there this past weekend and was told some people wear a bunch at once. We just returned from WDW and made very good use of our bands and FP+ Regardless of how you feel about this new system, we discovered some advantages to it. A little child was separated from her family, because she had the band, a CM was able to get a cell phone number and contact the family immediately. One in our party was lost and returned to Guest Services. It was deactivated. Once we retrieved it, it was re-activated. Concierge was able to sync up our entire party’s FPs. I have a holiday booked in May this year and am staying at a WDW resort hotel. I have linked my reservation on the My disney experience app and from that have 5 magic bands that it says are ordered and can be customised. However I live in the UK and it states that I have to use a US address. Does this mean that I won’t be able to customise my magic bands? We just returned from a great Disney World vacation (Fort Wilderness Resort). We were skeptical about MagicBands before we went, but our family group of all ages really got into MagicBands in the end. On our last night, FP+ in the Magic Kingdom was really sweet! The Disney Cast members were amazingly patient with everyone until we all got the hang of them. I must have bonded with my pink MagicBand. I not only wore it to work today but planned my clothes to match. 2. I had a magic band from a hotel stay, but I threw it out. When I tried to customize for the AP one, it just keeps taking me to the one I had. I can’t make a new one. But I no longer have the old one. What do I do? I hate calling Disney because you’re always on the phone forever, repeating the same stuff over and over and they never fix the problem. 1. It’s a rolling 30 days. So within any given 30 days, you can only book 7 days of FP+ reservations. Once the first falls off, you’re able to book another. Or if you cancel one and are left with 6, you can book another. 2. The site should give you the option to customize a new annual passholder MagicBand. Once you sign in to MyDisneyExperience.com, read the text at the top. You may find a link there to begin customizing a new one. If not, hover over the “My Disney Experience” logo in the upper right and go down to “MagicBands and Cards.” That page may have what you’re looking for. Did you link your passholder number to your account? My son and I visited Disney World last November and got to use the Magic bands. I, for one, LOVED them! I love being able to book my fast passes on them, have my room key, my meal plan, everything!!! It made life super easy. One day I had forgotten my receipt for the stroller and they were able to look up my charge for it from my magic band to verify that I had paid for it. It was great. Plus, my son loved being able to open our hotel door for us and scanning it whenever he could. I really wish they had them for Disneyland. I hate having to wait in line in Cars Land just to get a fast pass. Ridiculous. Everything should be done online. Everywhere. We LOVED My Magic + when we went in January 2014. We had the most fun this year of any trip. I think My Magic + helped us be more spontaneous. We already knew which parks we were going to be in because of our ADR’s. We loved not having to run across the park to get fast passes (especially for Toy Story Midway Mania). It was quiet enough that we were able to edit a few of them when we changed our minds. I also really appreciate all the help we got because we had issues matching up my Mom’s fast passes to ours. Thank you, Cast Members! I think everyone needs to calm down. This system has pluses and minuses, just like any other system. I agree that it is sad we will never be able to give away our fast passes as we leave the park again, or have others do the same for us. But, it seems like this system will do a brilliant job of managing crowds more effectively. They will know which parks need more staff and street shows. They will know when too many people are in one area and will have the ability to draw people elsewhere. I am going to focus on the positive. I am really looking forward to our next trip!